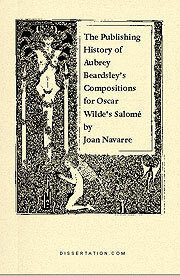 This study claims that scholars need to examine all twenty-seven English illustrated editions of Wilde's and Beardsley's Salomë to understand whether Beardsley's compositions do, or do not, illustrate Wilde's words. For the last one hundred years scholars have addressed the aesthetic function of Beardsley's compositions (whether or not Beardsley's compositions illustrate Wilde's words), and each scholar sees something different: Beardsley's compositions are "irrelevant" to Wilde's words; Beardsley's compositions are "relevant" to Wilde's words; Beardsley's compositions are both "irrelevant" and "relevant." What is at issue here is that this traditional dance of signification (scholars' interpretations of the aesthetic function of Beardsley's compositions) relies upon an interpretive strategy that disavows the history of textual transmissions. To put this another way, what scholars "see" depends upon the particular English illustrated edition(s) they read. Beardsley's compositions are physical objects conditioned by a physical setting--i.e., the components of total book design. Yet, for many, the visible appears invisible. The motivation for this study arises from previously unexamined phenomena--the genesis and textual transmission of Beardsley's compositions for Salomë (1894-1994). As historical textual scholarship, this study uses the methodologies central to descriptive bibliography: the English illustrated editions of Wilde's and Beardsley's Salomë are treated as socially constructed physical objects. Binding, format, and paper are a few of the signifying systems described. Specifically, this investigation draws upon the model presented by Philip Gaskell in A New Introduction to Bibliography. The necessary tasks include: transcribing the title-page; analyzing the format; examining the appearance of the binding; detailing the kind of paper used; and noting other information, such as titles. As the centenary of Wilde's and Beardsley's Salomë commences, this is the opportune time to trace the publishing history of Beardsley's compositions, to update existing descriptive bibliographies, and to turn to an empirical method for a socialized model of literary production.